Natural Break-up - Stays true to your original tone. Cleans up well - Seamlessly clean up your sound by rolling back your volume knob. True Bypass - The Empress Germ Drive employs true bypass, so you can be sure that it's not affecting the signal when disengaged. 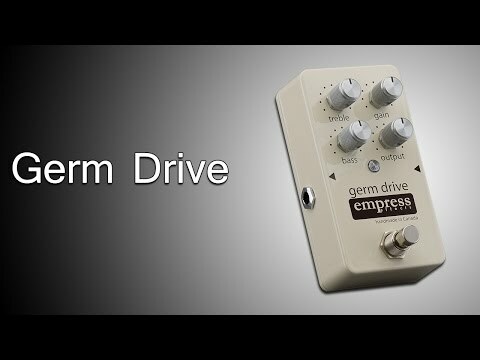 True to the tweed tube amps of the 50’s, the germ drive delivers warm, harmonically rich overdrive that cleans up with a twist of your volume knob. Its tube-like break-up sounds extremely natural and will enhance your sound without masking the original tone of your instrument. This true bypass overdrive offers gain control, two bands of EQ and output control to fully tweak your sound.